This hen was quite content in front of me at Dairy Farmer Dave's in Sanilac County. She stayed at least 15 minutes before moving on. Is that a little white flag you see at my side? I've just finished an eight out of 10 days stint in the turkey woods, where I tried both Sanilac County spots and an old standby in Gladwin County, and still came up empty handed. In fact, I didn't even have more than one confirmed gobble. I did see turkeys but only hens. I needed their boyfriends to stop by and pay them a visit. At this point, I'm pretty discouraged. And a little disgusted. In the past seasons, the second over-the-counter private tag license would start earlier in the first week of May. This year it started on the seventh. Seems like not having some of that week, along with the earlier spring as said by the Michigan DNR Upland Bird Specialist Al Stewart, has hurt me. The big boys just don't appear interested in a courting. And when that happens, it can be tough to find them. Of course, some have already ended up in freezers, so slim pickins' for this cowboy. I'm also a little frustrated the bum shoulder is likely a culprit in me blowing the one opportunity I did have on May 15. But I'm learning and living with this situation. It may be time to upgrade shotguns with one that is a little lighter than the 1993 Ulti-Mag Mossberg 12 gauge. Like with one of those Beretta 20s I see the H&S Strut guys sling during the "Cuttn & Struttn" videos. Then again, maybe the shoulder will gain some strength by next spring. Being so shaky in raising the barrel through the blind gave away enough movement for the tom to know something was up and it wasn't a frisky hen decoy. By the time the time I could get a shot off, he was on the move. It was a tough shot. That's why they call it hunting and not killing. I have a hard time fathoming I'll just have the one chance for pay dirt this season. I could use a few more birds like I also see in those videos. With three or four more outings planned, I may get that chance. If not, fall has been good to me the past two or three seasons, I'll give it heck then. Here's the view of my last setup of the day and also near where I missed the shot at a gobbler two days ago. Today's adventure in the woods/fields was highlighted by a blustery north wind and a curious hen that practically clucked into my ear. I was spooked for a change and in the process threw my cell phone. I later found it at my feet when I went to leave. Meanwhile the bird pranced onto a dead stump not five yards from me and trying all the time to decipher what I was and where I was. I threw her off with a few gentle yelps that increased the craning of her elongated neck even more from her position. The eight-minute standoff finally ended when she decided all was clear and she slowly crept into the woods behind me. That's how the day ended. I never saw or heard any of her boyfriends but it was hard to make out sounds between the 19 mph gusts of wind, which picked up around noon. Instead of doing longer two- to three-hour sits, I bounced from three different setups all of an hour or more. But there was barely any other action outside of the hen standoff. A hawk screeched overhead briefly at one point and appeared to be ready to dive bomb the hen decoy I had stationed along the turned field on the north side of the Sanilac County property. In the end it was a day I could have stayed out until dark -- with temperatures in the 50s and a bluebird sky -- but work and family obligations were calling, so I was homeward bound a little after 2 p.m.
As much as it pains me to say so, I blew a nice opportunity Tuesday. I had a decent looking tom slip into what I thought may have been a doomed setup and predicted correctly when he stepped around the brush jutting out into the field and pretty much made me. He saw the ever-so slight tipping of the the shotgun barrel, knew something was up, started putting and then high stepped in an about-face while I hurriedly clicked off a shot to no avail. And also thinking I should move, then don't and get burned. I learned long ago from an old timer in West Virginia that you don't want the setup to be one in which the bird either comes up a hill or around a corner (like Tuesday) and then boom -- he is able to see you first and you have to be quick to the draw. But I'm staying positive here. What I liked was how I still called in a cagey ole boy late in the season and during the midmorning no less. Also the determination is starting to boil inside me and I'm getting out much more than usual. This week -- third one in May -- has typically been a very hot one in my past experiences in Michigan. Now is the time and I am making it out into the woods. In the past few years I thought maybe I was turning soft and opting for the rack more instead of dealing with a little sleep deprivation. 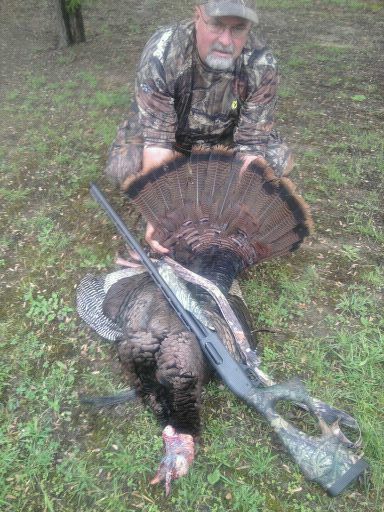 I'm fixed on blasting this spring gobbler slump into the past. 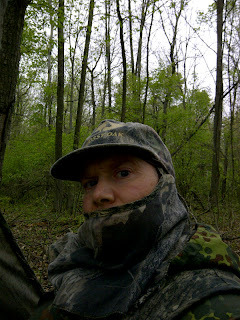 The expression on my face tells it all: After getting into position closer to the swamp -- where I heard one gobbler -- the rain started picking up again. One day out and the turkeys kept the upper hand but there's still plenty of season left. I'm not the kind of hunter that only goes out on the opener and then maybe a couple of days afterward. But at the same time I need to stay composed and not get overly obsessed to the point of early burnout. There is however a fine line here because whereas the deer season is 90 days long -- at least for me -- the turkey spring season is just under a month. I figure I can always get some sleep in June. Then there's the work factor and it getting in the way of my hunting. OK, I'm joking here. All of this was close to being thrown out the window on Monday's opener. 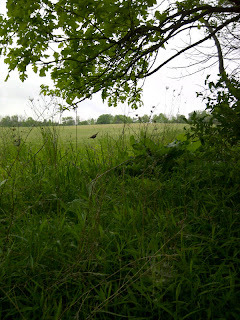 In a leisurely first light gig, where I finally was set up and making calls between 7:30 a.m. and 8 a.m., things didn't heat up until noon after I endured a smattering of rain and got up to wander in a small semi-circle on the Sanilac County, Mich., property. After again hearing little in the way of gobbling, I decided to make some high-pitched calls on the H.S. Strut Lil Deuce Ring Zone -- a new glass call I'm trying out this season. And it garnered some attention within 15 minutes. A gobbler started up on one side and another to my other side. It sounded as if they were beginning to close in with me in the middle. I held steady with the 12-gauge in position to fire as the rain went from a sprinkle to a shower and then I began to hear the one bird's gobbles gradually tail off. The other bird never appeared or made another sound. So yes I was left holding the proverbial game bag -- an empty one at that -- but I realized I was also very close to ending the season on the first day. During the soggy ride home in the blue Dodge pickup (which did make the trip like I promised it would in a previous post), my thoughts began to meander. 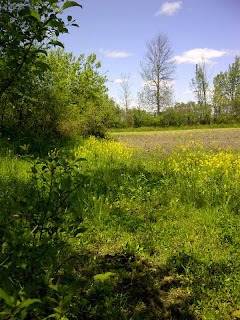 I was reminded one more time of how spring gobbler is often a matter of do-si-do-ing around the property where you hunt until you either both meet in the middle or wherever and you connect or you don't for some reason, then the whole process starts all over again. Like I said, there's still plenty of season left. At long last, I will be able to once again log tales from a hunt of mine on here. Likely, the next time we will meet again on here, I will have embarked on what is my 18th spring gobbler hunting season. The turkey tag I have is for Michigan's second season, which begins Monday, May 7. Some of the usual happenings are already in flow. The blue '97 Dodge Ram truck with more than 500K in miles is up to its usual tricks as the eve of another hunting opener approaches. For this one, we find that "something is hanging" -- as son Zac alerted me Friday -- underneath the ever lovable, but aggravating "Betsy." The something hanging is the gas tank. The support bands gave way. Rusted out. At least they decided to do so while it was parked in the driveway. But I made a vow that she would be "in the field come turkey day." Hopefully there will be a tagged 20-pound bird riding along in back after the day is done.